I am; you are; he/she is. Jag är; du är; han/hon är. One of the ways I find new interesting words is from watching English language television with Swedish subtitles. I have a lot of respect for the subtitlers’ work. For instance, on a recent show, Eskimo Pie was subtitled as glasspinne. There was nothing visual or elsewhere in the conversation to indicate that the character was talking about an icecream, and no real reason why a particular brand of icecream was chosen. The direct translation of Eskimo Pie is probably Sandwich, but that’s possibly a brand name, so the more general glasspinne (maybe, popsicle or icypole, depending on where you’re from) seemed to do the job pretty well. Gibbs: We investigated crime scenes. Franks: I investigated crime scenes; you schlepped. Here, schlepped is the past tense of the Yiddish verb schlepp, typically meaning ‘to drag [something]’, so in the intransitive sense, maybe something like ‘drag one’s feet’: see thefreedictionary, for example. Interestingly, Yiddish is another of Sweden’s five official minority languages (remeber, I already mentioned Romani, so three more to go). Yiddish is a Germanic language, so it wouldn’t be surprising, would it, if we found similarities between Swedish and Yiddish words. And, in fact, the Swedish verb släpa does have both the transitive and intransitive meanings of schlepp. Oops! Unfortunately, du sov = you slept, so the error was in mishearing you schlepped as you slept, but unlike the Eskimo Pie example, there were plenty of visual clues to the correct interpretation. Plus a (very) little knowledge of one of Sweden’s official minority languages would have helped. Time to finish discussing adjective morphology. As a commenter pointed out, as well as underbar (wonderful), Swedish also has underlig (strange). But in case you might start thinking you discern some difference between the -lig and -bar endings, think again! Swedish has two similar words for edible: ätlig and ätbar, and three similar words for visible: synlig, synbar, and synbarlig. All those words are in SAOL, but some of my colleagues don’t think synbar is a “real” word. And interestingly, when it comes to opposites, SAOL lists only oätlig and osynlig. I did say morphology was fun, and it’s also a useful way of packing a lot of meaning into a small space, but sometimes there’s a tendency to get a little carried away with it. For instance, on a crime show I was recently watching, one of the detectives was talking about the directionality of a line of blood drops, where the word direction would have done just as well. From a morphological standpoint, the noun directionality is formed from the noun direction, plus the suffix -al to turn it into an adjective, plus the suffix -ity to turn it back into a noun again. Sometimes suffixes do carry specific meanings (consider employer versus employee), but sometimes, as here, I can’t see that they do: the suffix -ality, in particular, often seems to serve the sole purpose of increasing the length of a word. To illustrate the ability of morphemes to carry specific meaning, consider osynlighet (invisibility). Without all those little morphemes, one would have to say something like “the property of not being able to be seen”, which is verging on the unreadable. Note also that the order of the morphemes is identical in Swedish and English. Next week, time to tackle verbs again. Let’s see if you can work out why skapade is this week’s word, before I tell you? While I’ve been pointing out some of the tricky parts of Swedish grammar (but there are many more…), you might have noticed that the English and Swedish versions of my examples have essentially identical word order. So is this true, do English and Swedish have the same word order, and what are the rules about word order anyway? There are many aspects to word order, such as the position of the basic elements in a sentence, and the the position of modifiers (such as adjectives) in relation to the words they modify. Both Swedish and English are SVO languages, that is, they follow the general pattern subject-verb-object. See what I mean? The addition of nu (now) at the start of the sentence forces the change in word order, such that the verb stays in the second position. And by “position”, I don’t mean it’s the second word in the sentence, since each position can be occupied by a phrase, which may consist of more than one word. I begynnelsen skapade Gud himmel och jord. The astute amongst you will have noticed that the headings of my posts always start with ‘v’, then a number. The Swedes will know that this means the ISO 8601 week number (vecka = week). It’s a reminder to me to post once a week, but it’s also commonly used in Sweden. So instead of talking about “the week of February 22nd”, one can just say “week 8”. I knew the ISO would come in handy one day! There’s a pretty simple rule to work out week 1 – it’s the week containing the first Thursday in January, and the numbering continues until the following year gets its own week 1. So this means that some years, such as 2009, end with week 53, and then 2010 starts with week 1: two consecutive odd numbers. In Australia, garbage in our suburb was collected every second week, and we had a little calendar on the fridge to tell us which weeks those were. In Sweden, our garbage is collected on even weeks (jämna veckor), so I guess no collection to start the New Year. And now here’s a little more adjective morphology for you: the Swedish prefix o- means un-. 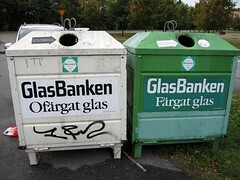 For example when recycling glass, there’s a choice between the färgat (coloured) and ofärgat (colourless) bins. Why there’s no word for “clear” glass, I’m not, well, clear. Similarly, the opposite of jämna is ojämna, but one could also use udda (odd). If you were paying attention last week, you should be wondering whether jämna -> ojämna represents derivational or inflectional morphology. And the answer, I’m sure you can work out for yourself (that’s what makes linguistics fun). They should say, Saturdays of uneven weeks, or Saturdays of odd weeks, but I know what they mean. Sometimes Saturdays can be uneven.